SPALDING, Lincolnshire — A recently-aired documentary that centered on a plot between a young teenage girl and her boyfriend to kill her mother has made public the boy’s confession for the first time. 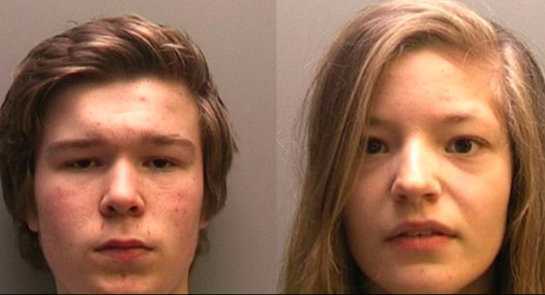 Lucas Markham and Kim Edwards, then 14, were both sentenced to 17 years in prison last year after Markham admitted guilt and Edwards was convicted for her part in the crime by a jury. “Then she realized I was being serious, so she started being serious,” he said. According to reports, the teens concocted a plan to kill Edwards’ mother at a local McDonald’s. Markham then went to his girlfriend’s house with a bag of knives, and knocked on her window while the others were sleeping. “Then I went in to her mum’s room, stabbed her in the neck while she was asleep on her side, and smothered her face with a pillow,” he told police. The teenagers then reportedly watched the “Twilight” movies following the killings, hence being dubbed the “Twilight killers.” Some reports state that the two sought to kill Edwards’ mother for trying to break them up, while others also note that Edwards wanted to get back at her sister for getting more of their mother’s attention. Police found the bodies days later. Detective Superintendent Martin Holvey of the Lincolnshire Police Department said that neither Markham or Edwards showed any remorse for the crime. “It was a really brutal chilling, cold and callous act that was carried out by these two children on two defenseless victims—who should be here this day, but unfortunately they’re not,” he said during the documentary. “The fact they were children and so matter-of-fact about what happened—showing no remorse, in the many years that I’ve been doing this job both investigating homicides and running homicides was, I would suggest, unheard of,” Holvey lamented. While Markham pleaded guilty to the crime, Edwards claimed that she suffered from mental issues that clouded her judgment. She was convicted by a jury last October and the two were initially sentenced to a maximum of 20 years behind bars. The sentence was reduced to 17 years upon appeal. A UK court had initially banned the release of the teen’s names, but last December, Justice Charles Haddon-Cave lifted the ban for the public interest. The names were still kept quiet while an appeal was underway. “The corollary is that, unless one knows this singular fact, it is impossible to understand the true motive behind these murders,” he said. In Mark 7:20-23, Jesus outlined that murder begins in the iniquity of the heart.